If we can build a flying car and 3-D print an entire apartment building, why the heck are we still charging our smartphones and tablets with chintzy wires and clunky power mats? You’d think by now we could juice them with invisible laserbeams of light instead. It may sound like a stretch, but that’s precisely what Wi-Charge claims it can do. The Tel Aviv-based startup says its patented, futuristic tech can power up your smartphone, tablet and laptop basically from thin air. No lame mat and no messy wires required. All your gadgets need to stay charged, Wi-Charge says, are its super-powerful infrared laserbeams, somewhat like the kind NASA used last year to power an unmanned model plane, only shorter-range and a lot safer. Think of the infrared light in your TV remote, only “a million times stronger,” and you’re there, Wi-Charge co-founder and CEO Victor Vaisleib told Yahoo Tech. Without going into nitty-gritty detail, here’s how it works: A Wi-Charge transmitter -- affixed to the ceiling, mounted similarly to a smoke detector or a light fixture that’s wired to a nearby electrical power source -- emits a narrow, invisible laserbeam of infrared light across a 500-foot area. The light then bounces off of a mirrored photovoltaic Wi-Charge receiver that’s placed inside a small electronic device (your smartphone, laptop, wireless speaker, etc.) or via an adapter plugged into the device’s charging port. Upon contact, the light gets transformed into electric energy and -- zap, just like that -- it begins powering the device. Buh-bye tangled-up charger wires. In terms of speed, the Wi-Charge laser system won’t work lightning fast, however. With a 10-watt max output, its makers say it’ll only be about as fast and efficient as your typical plug-in charger. For now, the transmitter is about the size of an average ceiling light, though one day it could be as small as a light bulb. The receivers that catch the transmitter’s light can be placed inside of the device it charges, or on a dongle or device case, like a smartphone cover. 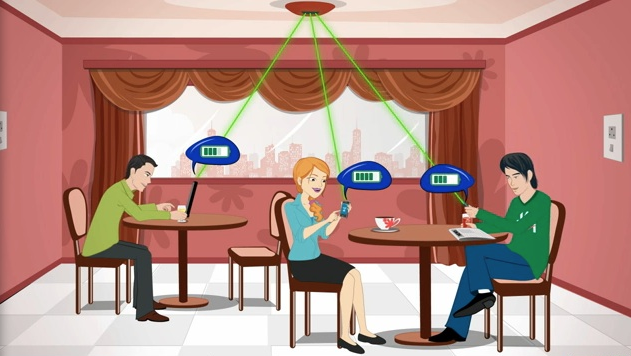 Wi-Charge envisions the transmitters beaming power everywhere -- in your home, at the office or the gym, anywhere where gadget-addicted people roam indoors. All those crazy, high-powered lasers bouncing from the ceiling to energy-sucking gizmos and back -- and bumping into your body all the while -- might not sound safe, but Wi-Charge says they are. “Our system is physically incapable of delivering any power to foreign objects, including human tissue,” the FAQ on Wi-Charge’s website states. They also say the doodad emits zero electromagnetic radiation. Phew. Founded in 2010, the company is still testing prototypes of its transmitter, which it recently demoed and claims it can charge multiple devices at once. Eventually, all you’ll have to do is waltz into the room with your Wi-Charge receiver-equipped device and you’ll be in charge. Sort of. Maybe. Wi-Charge told CNET at its demo in San Francisco that it expects its first transmitters for the home to arrive in the first half of 2016, priced between $50 and $100. The mobile receivers are slated to arrive in the first half of 2017 in the form of a dongle or smartphone case. 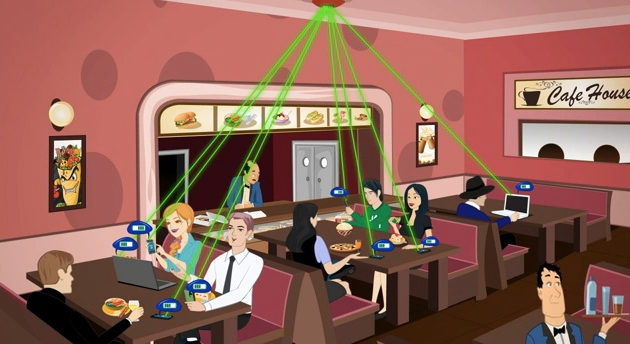 Receivers that can be embedded into devices could be a reality by 2018.